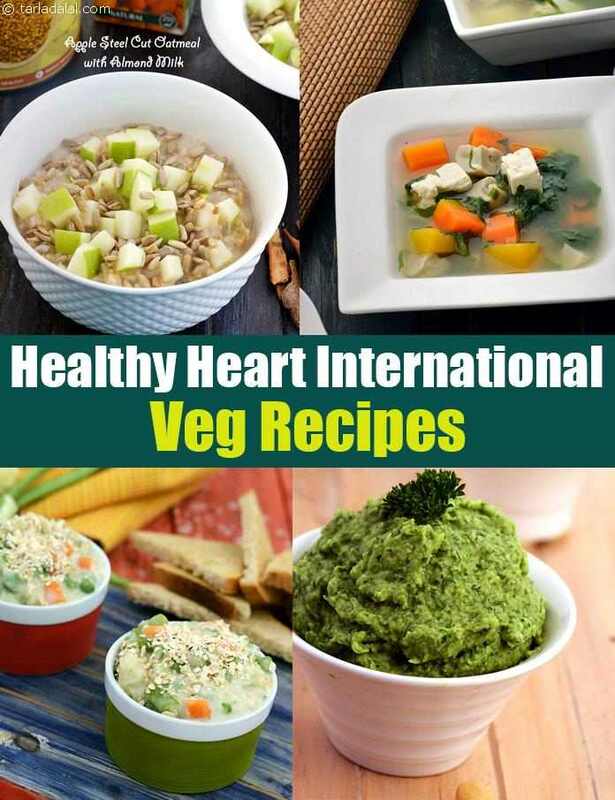 healthy heart international recipes. When you think about International cuisines, creamy pastas, cheesy pizzas, nachos and deep-fried tortillas are the kind of dishes that flash into your mind. This might instantly make you dissociate these with a healthy, low-cal meal! Come, let us make the meal more fun, with heart-friendly, low-cal versions of these tasty international favourites like Falafel, Waldorf Salad, or Whole Wheat Pasta in Low Calorie White Sauce, etc. With a few smart variations, we make these recipes acceptable as occasional treats, to be enjoyed in limited quantities. Originally plain flour (Maida) is used to make the tortilla dough of quesadilla but we have recreated quesadilla recipe and made it healthier by using whole wheat flour, try our recipe for Healthy Bean Quesadilla, a nutrient dense recipe. Paneer and Broken Wheat Patties in Whole Wheat Pita Pocket is a nutrient packed recipe rich in protein, calcium and fibre. All of these good for heart health. Are your cholesterol levels high? Then you must eat low calorie snacks like Lettuce Wraps that is loaded with fibre which helps to reduce the cholesterol levels. Use a combination of vegetables and fruits like how we created this healthy Waldorf-Salad, prepared using zero amount of oil and rich in fruit and vegetable anti-oxidants for heart protection. You can also add ingredients like boiled whole wheat pasta in your salads to make it filling just like our recipe for Pasta and Vegetable Salad, though it is low in calories it is quite filling and you will avoid eating in between meals. Apple Crumble is one of its kind recipe which has a distinct flavour of stewed apples and cinnamon, cinnamon is also good for heart and should be included in your regular diet. Usually apple crumble is loaded with refined flour and fat. But our recipe has Also a source of omega-3 as it has good amounts of walnuts and almonds. Vegan Oats and Coconut Milk Pudding is a unique recipe with heart healthy ingredients like oats and coconut milk and can be had as a dessert or breakfast. Most of the international desserts are not a good source of fibre but we have a recipe for Hawaiian Fruit Bowl with Vanilla Cream which is a fibre rich, low fat and antioxidants rich recipe good for heart health. Try our healthy heart international recipes and healthy heart recipes articles below. Pizzas are usually considered to be calorie-laden. Now, here is a healthy version, made with only 1 teaspoon of cheese per pizza and a whole lot of veggies, yet maintaining the authentic pizza taste.